When you’re hiring a skip for a project at your home, it can be very irritating and expensive when you find that it’s already been filled by your neighbours not long after you’ve received it. Unfortunately, you will have to pay for the skip to be emptied in this situation, because it is very difficult to prove that it wasn’t your waste. However, there are ways that you can prevent this kind of anti-social behaviour from happening when it’s time for you to hire a skip, which will help you to save you money and hassle in the long run and keep your project on schedule. 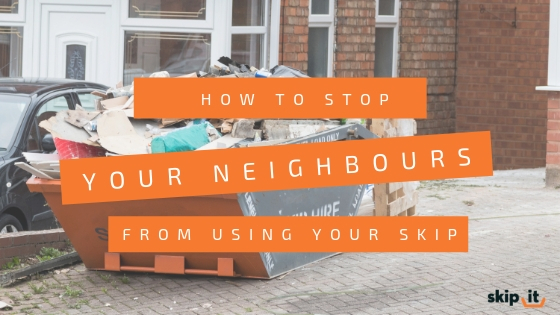 Read on to find out how you can protect your skip from being used by your neighbours. If you have hired a skip and are worried that your neighbours might start to use it, then the easiest thing to do before your skip arrives is to let them know the type of work you will be carrying out on your home. When you communicate with your neighbours, you can set some ground rules and let them know that you will need to use the skip’s capacity for yourself, but you could extend an offer to let them know you are happy to let them use any left-over space after you’ve finished using it. If you decide to offer this to your neighbours, then it’s best to let them know a date and time when you are happy for them to start using it. Most people will be reasonable and will wait a few days to get rid of their rubbish in your skip and they might even offer to pay you some compensation for doing them a favour. If you have room on your property that has a suitable surface for placing a skip, then an easy way to help prevent your neighbours using it is to place it on your private property. This will help to let them know that the skip is being used privately and it won’t be easily confused for use as a ‘public’ skip. Areas that you could locate your skip include your garden or drive. If you share a drive with a neighbour, it’s a good idea to let them know where you will be placing your skip before it arrives! If you cover your skip securely after you’ve finished using it each day, then it will be much harder for someone else to fill it with their own waste. The most effective way to cover a skip is to use tarpaulin and to weigh it down with some bricks or loose rubble on the surface. You can also tie the tarpaulin securely with bungee cords or some rope. If your skip is placed on a public road then you’re legally required to place traffic cones around the skip. The skip must be equipped with night-time safety lamps, reflective markings and the name and telephone number of the skip hire company. Luckily, when you hire a skip from Skip It, we can provide all of this for you! You may consider putting motion-sensor security lights near your skip if you’re concerned that your neighbours might try to use it during the night, even if you’ve asked them not to. By shining a light on your skip at night or installing motion-sensor lights near your skip, you will be alerted when it’s being used by others. The best solution is to fill your skip frequently whenever you have waste left-over from your project. Just remember to be careful about overfilling it, because this will cost you money in the long run and it could jeopardise the safety of the skip hire removal crew when they come to take it away. To find out more about skip health and safety, take a look at our handy blog. Skip It offers a variety of different sized skips to suit all projects and our friendly team will be happy to advise you. Choose our Skip Hire service today to find out more!